Not every fly fishing professional is a member of Team USA like Lance Egan, but, instead, is a pillar of our local communities. These people make the underwater world accessible to the rest of us: guides, tiers, writers, editors, biologists, trout bums, captains and shop owners. We have amazing people all across New England, and they are doing good work out there. I hope to introduce you all to some of them, but I don’t know everybody (yet). So, if you know someone who fits the bill, let me know, and maybe we can get them some much needed appreciation in this new and ongoing series. Lets get the simple stuff out of the way: Who are ya, where did ya grow up, and where do ya guide? My name is Geoffrey Klane. Growing up in Westborough, MA, I then went to college in Burlington, VT (Champlain College, BS in Digital Film Making) and now am currently located in historic and beautiful Lowell, MA. It was my move here that sparked my love of fly fishing, and, as such, it is one of my favorite places to fish. In addition to the guiding the Lowell Canals for warm-water species and carp, I guide on small streams in Central/Northern/Western MA for trout and landlocked salmon, as well as the sea run brook trout streams of Cape Cod. What type of species do you like to target? I like to fish for anything that will put a bend, however big or small, in my fly rod. Good answer. One of your specialties is providing a variety of experiences for your clients, what’s the craziest day on the water you have had? One day I had the pleasure of taking my good friend Adam out for one of his first fly rod outings. I wanted to make the day as special as I possibly could, so we started the day getting him acclimated on the Lowell Canals fishing for big panfish and smallmouth and finished the day by heading up to Plum Island and getting him his first stripers on a fly! With so much variety in New England, what do you think is the most underrated system in New England? I have a couple answers for this…. I feel that MA in general is a largely overlooked INCREDIBLE fishing destination on par with Washington, Wisconsin, and or Florida, to name a few. Our state has some of the most spectacular fresh and saltwater fishing that New England has to offer, and I feel like it doesn’t get the credit it deserves…. I can only imagine what would happen with some serious new-age conservation efforts in favor of native fish and preserving cold-water fisheries…. My favorite system…. I don’t know that I can pick just one…. There is something about Massachusetts; there are so many DRASTICALLY different fisheries, all within one to two hours of each other. You might want an answer like, my favorite system is “BLANKETYBLANK” but really, it depends on the day. There are days I want to find a small stream, not see a soul, catch one fish (or more if fate smiles on me), and call it a day. Then there are other days that I want to stroll the Lowell Canals with my dog Chips Ahoy, and chat with all manner of passer-by about just how awesome the fishing is, that no one else seems to be enjoying. I love fishing New Hampshire and the small portion of Maine that I have fished (can’t wait to explore more of both). But, I also want and feel a profound need to explore all that is the fishing world. Definitely starting small and working out from MA, but, also, the West Coast, Florida, Kamchatka, Costa Rica, Iceland. The list goes on, I want it all. I couldn’t agree more about MA; I have really fallen in love with the streams around here. I also love your Agerhønen fly and your Montreal [ahem] streamer fly and the Edison variants you tie. Where do you find those unique patterns? I cannot even begin to accept credit for these fantastic and beautiful creations. I, like you, found these flies through research and time pursuing my passion in all things fly fishing. The Light Edson Tiger was my introduction into that style of classic streamer. I learned of the pattern through my volunteer efforts with the Sea Run Brook Trout Coalition. I learned that the Light Edson Tiger was a favorite of the Lyman family, the ones who owned, protected, and developed the Red Brook Property, before deeding it over to the Trustees of the Reservation. I learned about the Montreal streamer from the one and only Alan Petrucci, who posted about it on his fantastic blog, Small Stream Reflections. Alan not only is an incredible person and angler, but he takes some of the most stunning pictures of his surroundings and quarry as he traverses the small streams of New England. Highly worth a read. I first saw the Agerhønen on Instagram, tied by Morten Hansen (@coastfly) and was so enamored by it, I had to replicate it. Upon further investigation, I learned that the fly had long been tied by Danish anglers in their pursuits for sea-run trout and salmon, and I figured it was worth a swing on this side of the pond. The fly’s recipe is as the name suggests: Partridge! But, really, there is great stuff on Global Fly Fisher, another very informative blog. What’s the #1 thing that you wish people did or didn’t do when they hire you? I can honestly say that I have yet to have a “bad” client. I have truly enjoyed every outing that I have had. Whether the day is challenging or not, if we struggle or succeed, nothing matches the joy I get from being on or near the water and getting a friend into a fish, even if it is just one fish, sharing in that memory, it’s something special. If I could guide full-time, I would without hesitation. If there was one thing I wish people would do, it would be to tell their friends and leave an honest review on either my Facebook, Yelp, or website, so that others can come out and share the fun of our adventures of the water. Can you tell me about the secret cabal of mystical trout whispers that keep the big fish away from the end of my line? Does telling you that it doesn’t exist make it any more or less believable? I believe that (at least) 50% of fly-fishing and getting “the big one” comes from just being out there, no matter what, the other 50% is saying, “Heeeeeeeeere fishy fishy fishy….” but even that might be saying too much. You have only been fly fishing for a couple years, but as anyone can tell from the testimonials of your guiding and your Insta feed, you have gone from intro to pro pretty quickly. Words of advice for the aspiring guide or just someone trying to get their first fish on the fly? There is a lot of material on Ye Olde Internet, telling you about the “right and proper way to fly fish.” While there are many a valuable gobbet of knowledge, all worth digesting at a comfortable pace, I believe that there are few hard-and-fast rules in this fantastic life-style that we sometimes call a sport. I am fortunate to know and fish with dry fly purists and new-age streamer junkies alike, and the beauty of it all is, every one of them loves to catch fish. No matter how you do it, as long as you do it in a manner which serves and respects nature, you can’t go wrong. I can say that I maybe fished five times before 2015, now, if I get less than less than 200 days outside or on the water per year, something is wrong. I am fortunate that my schedule worked out in such a way that I could dedicate a lot of my time and energy into fly fishing, I fell in love with everything about it. I couldn’t agree with you more on that. If people want to get hold of you, what should they do? Feel free to email: [email protected], reach out over Instagram (@brackishflies), or Facebook (here). I’ll get you my direct number and we’ll make it happen from there! Author’s note: I first met Geoff at the Marlborough Fly Show. Neither of us paid much mind to the other but we have run into each quite a bit as of late, and I really like the guy. His pursuit of the #wildfireball is inspirational. He also has a Pocket Fishing Journal (pretty awesome!) which I will plug for him since he was too nice to do it himself. geoff might be an exceptionally good guide but i know him as a great supporter of our Project Healing Waters Veterans. he’s stopped by a few times to drop off a collection of flies for their benefit but also to jump right in and tie alongside the guys. thanks geoff! Hire Geoff for your next trip! Geoff guided me this past weekend and we had a great outing exploring small streams in Central Massachusetts. 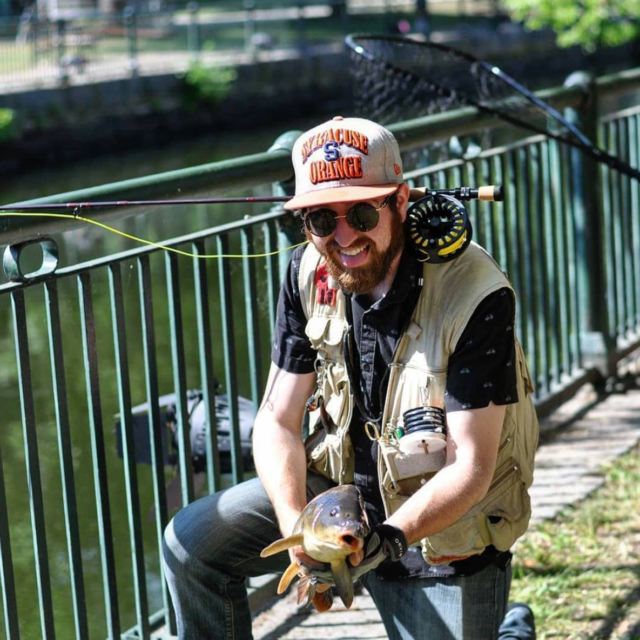 He is the one of the few guides that will do a wade trip on bodies of water like these, and he also has unique offerings in Lowell for carp and Southeast MA for salters. Highly recommended. I can agree with that! Seen him work with some of the Project Healing Waters Participants at a Vedavoo Vise Nights. Really good dude.